Forthcoming publication in 2019 from ICNC Press. The amount of English-language literature in the field of civil resistance has rapidly expanded in recent decades, while the demand for materials in languages other than English has dramatically risen. This glossary of over 150 terms is created to help make this knowledge available to people around the world. 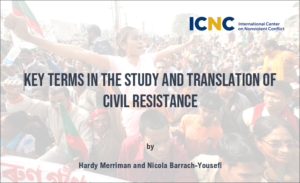 Its primary goal is to help with the translation of information on civil resistance from English into other languages. We expect other readers will also find value in it—a great deal can be learned through deep understanding of the terms in this field.